VIRGINIA: Ad Agency Tweaks Iconic State Slogan - Joe.My.God. Back in 1969, it was a playfully controversial tagline. Today, one small tweak turned it into a statement of tolerance and solidarity in an increasingly divided America. The Martin Agency of Richmond, Va., responded to the violence and hatred displayed in Charlottesville, Va., last weekend by telling as many people as possible that its home state is for everyone. Copywriter Robin McLaughlin helped develop “Virginia Is for Lovers” nearly 50 years ago (when Martin was still known as Martin & Woltz) after running through variations on “Virginia is for…” The line, which was inducted into New York’s Madison Avenue Advertising Walk of Fame by popular vote in 2009, is now widely recognized as America’s longest-running state tourism slogan. 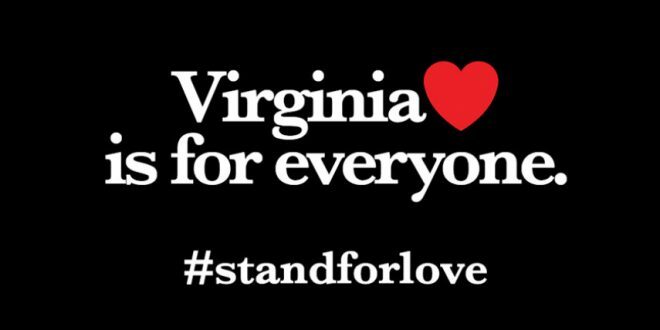 They tweaked the classic tagline to read “Virginia Is for Everyone” and added the hashtag #standforlove to emphasize that, contrary to widely circulated images of torch-wielding white supremacists and violent clashes between protesters and counter-protesters, Virginia is a place that welcomes all visitors.